"Seeing these colours, grave doubts remain as the differences are so great, even taking into account colour shift and fading. In that case, could there also be the possibility that the colour number used in Kugihô 0266 were according to a paint specification other than (Kariki) 117? We presumed that the colour numbers used in Kugihô 0266 were those in (Kariki) 117, but there is not one reference to (Kariki) 117 in Kugihô 0266." The colour measured from the remains of a Type 1 Rikko (either K-913 or K-393) by Dr Charles Darby appears to be much closer in character to the facsimile chip for H2 and the Navy colour N11 as identified by Donald W Thorpe, but of course we have no way of knowing whether this colour was actually H2 as applied. Also, it is not possible to determine that the brown colours as displayed in Kugihô 0266 and Kariki 117 were the same brown colours used in the early kumogata schemes applied in China, as depicted in the contemporary artwork shown here. The precise appearance of the early kumogata browns remains somewhat elusive. The Hasegawa suggested GSI Creos paint mix for their G3M kit results in a rich, reddish medium brown somewhere between 5 YR 3/3 and 5 YR 4/4, a colour closest to Thorpe's N11 Medium Brown (5 YR 3/4) and the colour found on the Type 1 Rikko K-913/K-393 but with a stronger chroma. Not all bad news for modellers, though. Armed with the contemporaneous artwork and the colours identified in Kariki 117, by Don Thorpe and shown here, it is possible to make an informed choice about how to present the IJN browns on a model. 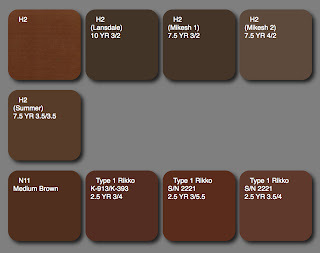 Thanks Nick, for your hard work in compiling this summary of the 'Kumogata' brown color(s) data base. Having it all together in one place is/will be a great convenience for future reference and study. Thanks also to all those who contributed the various peices of color information presented in your summary. Since contemporary artwork suggests several different browns were used, having more relic samples might be helpful. Or perhaps a find of a more definitive color standard specification for the 'Kumogata' brown(s) might possibly clarify the situation. It is also possible, now 65+ years since it was last in use, that we will not gain new or additional evidence more convincing than that now to hand. Were there any relic or souvenir hunters active in China in the late 1930s? I have not heard of any, but is that in fact the case? If so, did any materials collected, for private or governmental purposes survive, perhaps in some sort of archive? An ideal situation would be to learn one or more of the European and American military delegations, then in China and working to support the Chinese airforce, performed an intelligence function. If so, did they consider the camouflage in use on Japanese warplanes? Where now to find any data that might have been so collected? Thanks for commenting. There was certainly intelligence gathering in China by the British and some of the data still survives across several archives here. A complete intelligence dossier was prepared on the Zero, for example, which included information on appearance, armament, performance, etc. "In May 1941, a Japanese Zero fighter had been shot down in China. Full details of its armament and tankage came through to Singapore and were passed on to the Air Ministry on 26th July 1941, as well as to HQ Air Command, Far East. Later, an air attache in Chungking sent estimated performance figures, which turned out to be very near the mark. All this was forwarded to the same two authorities before the end of September. But faulty organisation at HQ Air Command, whose establishment did not include an intelligence staff resulted in this valuable report remaining unsifted from the general mass of intelligence information and in no action being taken upon it."